Your fish are too good to be living in ordinary tap water. The Chlorain and Chloramine causes damage to the fish and can completely destroy thier gills. 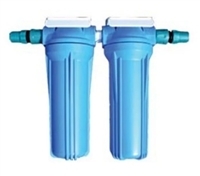 Our water purifiers are very keenly priced and remove chlorine and other undesirable contaminants. They fit onto your hose and the filters are replaced each year. This fitting screws into the Water Purifier so your garden hose can easily click fit onto it. This fitting attaches to the end of your garden hose so that it can click easily onto the Water Purifier. The cartridges should be replaced generally once per year or when flow is significantly reduced, depending on usage. These 10" filters will remove sediment as small as 5 micron, extending the life of the carbon filter in the 2nd unit. This should be replaced at least once a year, or when flow is significantly reduced. Removes chlorine from tap water making it safe for fish. An effective water purifier for removing chlorine and other toxic substances from your tap water. Complete with garden hose click fitting inlet and outlet. We supply your first carbon cartridge free. To extend the life of your purifier we recommend you buy two of these units, join them together and put a solids filter in the first unit. A complete water purifier with solids pre-filter and carbon de-chlorinator. This unit has 2 cartridges which can be replaced. They should be replaced at least once a year, or when flow is significantly reduced. We make up this unit with hose-click on both the inlet and outlet so it can be fitted anywhere along your garden hose. Removes chlorine from tap water making it safe for fish.